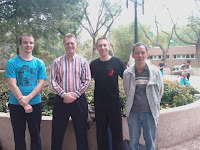 Today I decided to head off to Kowloon Park where many of my martial arts colleagues assured me there would be plenty of good gong fu / wushu to watch. Luckily I chanced upon a resident of one of the surrounding apartment blocks; a pleasant ex-Singaporean who was going for his morning exercise. 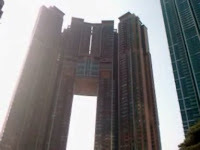 Without hesitation he went out of his way to walk me through a maze of building complexes, subways and escalators until we came out again into the first bright, sunny day I'd seen since I arrived. 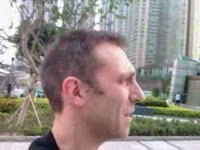 "There," he gestured into the still hazy distance (for even a sunny day in Hong Kong doesn't mean what I'm used to), "you see that group of buildings over there?" Far in the distance, around the corner of a bay, I could see an outcrop of buildings huddled in the mist. "Head for those buildings, then turn right. You can't miss it." So much for getting there early. Moreover I had chosen the first and only hot, humid day of my stay in Hong Kong to go for an extended walk. 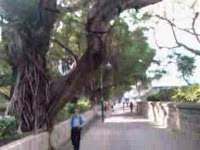 By the time I reached Nathan Road I was already drenched in sweat but thankful for the giant fig trees lining the pathway. Not long after that, I climbed the steps up into the postcard-perfect world that is Kowloon Park; a maze of themed and manicured gardens, broad leafy trees and boulevards. As I had expected, people at every turn were performing their morning exercises. It seemed I was not too late. 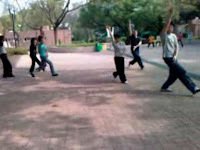 Taijiquan and related (often minimalist) qi gong exercises were the most common. What struck me most about the taiji practice was the speed at which it was being performed - or I should say the lack of speed. 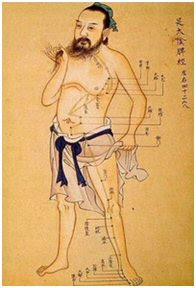 In some cases movements were being executed so slowly that I wondered if the practitioners were frozen, often mid-step. I wandered about for a while, admiring the atmosphere of diligent practice and enjoyment. In one paved area I chanced upon some women practising taijiquan sword, the leader/teacher taking them through dragon-like movements of exquisite elegance and beauty. 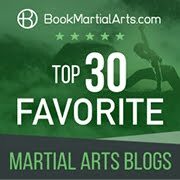 In another, a group of children with stoic, fixed expressions went through endless repetitions of a Shaolin staff form with military precision and unrelenting intensity: their skill level far exceeded anything I'd ever seen in children of their age (the youngest must have been no older than 8). 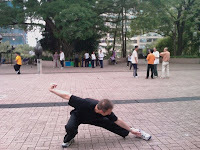 Presently I chanced upon a group of 15 or so people practising bagua in small sub-groups. Their teacher was European - something I had not expected to see in Kowloon Park. 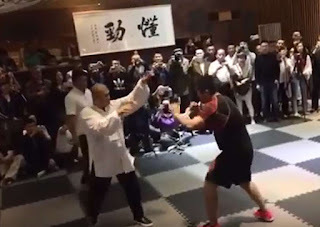 I sat for a while and watched their style which reminded me of Youtube footage I'd seen of the late mainland bagua master Sha Guozheng (it turned out later that he was, in fact, the grandmaster of this group). 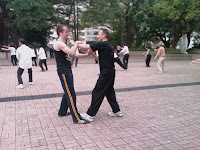 One student (the only other westerner) was practising some xingyi, in particular the linking form and later the monkey form. I sat down and watched them practising for a while then, when there appeared to be an appropriate break, I went over and introduced myself. 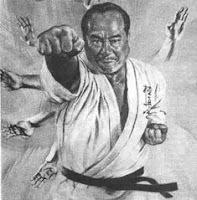 I discovered that the instructor was none other than Hans-Kurt Schäfer, a direct student of the late Sha Guozheng (1904-1992). Hans Shifu greeted me cordially and was more than happy for me to watch their training and take some photographs. Later it transpired in discussions that he knew my shifu, Chen Yun-Ching; they had met during a trip to Taijung. Hans had even seen my picture on Master Chen's wall! After discussing the Chen Pan-Ling system (and in particular Master Chen Yun Ching's openness and generosity in imparting knowledge), Hans invited me to demonstrate some of my school's material, which I did (somewhat haltingly, having spent the preceding week cooped up in a conference room). 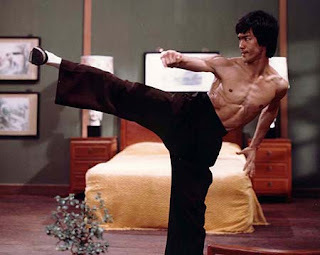 First I showed some feng quan - ie. 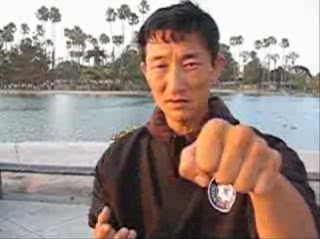 Chen Pan-Ling's synthesis of his favourite Shaolin, xingyi, bagua and taiji moves named "mountain top boxing" after his nick-name "Feng" meaning mountain. I also demonstrated our version of the 5 elements linking form from xingyi. I was then given the privilege of taking part in some of the lesson, including "playing" (their version of our "randori") with Hans' student Chris (who I had previously seen practising xingyi); a very interesting experience given the extremely different fighting method/style they use. It is rare to get a chance to "cross hands" with someone from a completely different style, and I'm sure Chris appreciated the opportunity as much as I did. 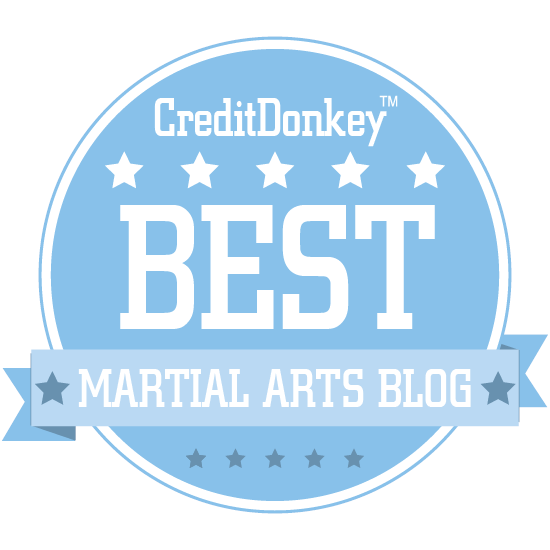 I certainly learned a valuable lesson from him: that "snake creeps through grass" is a potent antidote to a standing arm bar! 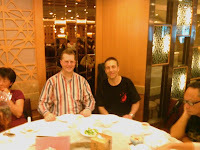 When practise was finished I was given the further privilege of joining Hans and his students in their post lesson custom of a dim sum brunch - and every entreaty to contribute was refused. 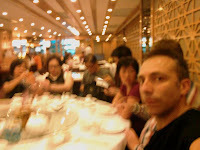 Not only was the hospitality unmatched, but the dim sum was the best I've ever had, by far! A very civilised way to end a training indeed. During our brunch the students bantered away on a variety of topics that changed as often as the myriad dim sum dishes being brought to the table. I was surprised to find them conversing amongst each other in Mandarin rather than Cantonese - the "lingua franca" of Hong Kong (one of Hans' students confided to me with a mischievous grin that "we only speak Cantonese when we don't want shifu to know what we are saying"). I asked Hans what his background was and he mentioned that he had started his martial arts career back in his home town of Frankfurt where the only martial arts school within reasonable distance was a taekwondo club (there was an aikido school a bit further away and Hans seemed somewhat wistful about missing the opportunity to have studied there). 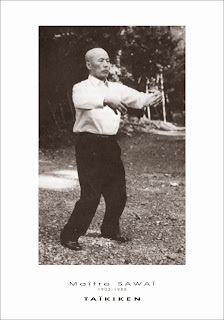 He then moved to yang style taijiquan which he studied for 15 years without any cross-training. Hans shifu regularly makes trips to the Chinese mainland to study with his late teacher's surviving senior students. Was there any danger in knowledge being irretrievably lost with each passing year? "Of course," Hans replied, laughing and pointing around the table. 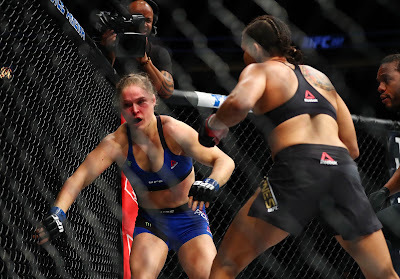 "Each of my students does the same move slightly differently. Over time the differences in emphasis and technique are magnified and the changes become quite large. It is unavoidable." At the same time it emerged from our discussions that he felt that there were only so many ways of skinning the proverbial cat; the same knowledge could be found in, or perhaps rediscovered from, a variety of sources. In fact, now that he had acquired a higher skill in a number of different arts Hans felt he was beginning to see just how related they all were. 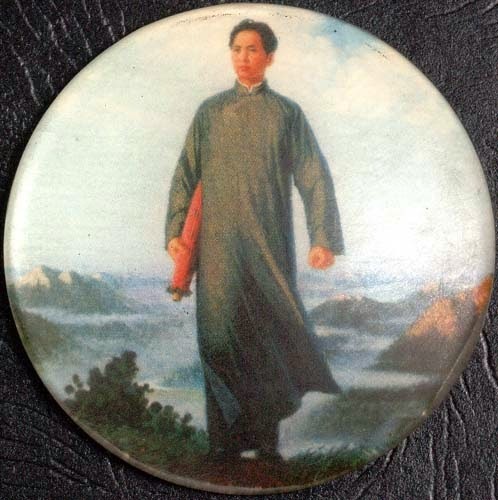 He lamented that he had not cross-trained during his yang taijiquan era, attributing some of his dogged loyalty to his German nature. He said to me: "I spent so long digging one very deep hole; now that I have dug some other smaller ones I'm able to see the same vein from a different perspective." I suggested to him that perhaps that first hole taught him the very importance of digging, and he nodded and smiled. "Perhaps." Your adventures reminds me of a story my favorite Anthropology teacher (Ralph Faulkingham) once related in class. It is necessary to go abroad and do field work, and Ralph, a young student embarked on his studies by choosing to spend a year living with a tribe in Africa. You never know what to expect, as the best plans can go awry. He expected to be met by someone, but instead found himself walking down a rural road, far from home with no help. As he approached the village, all the people stood watching him approach, making no effort to greet him. With his rudimentary knowledge of the local dialect, he tried to make himself understood. That he was a student, and traveling to do research. Somehow, that struck a chord, their demeaner changed, and they welcomed him. Apparently, it is rite of passage for young men to leave the village, to travel over the mountain, and come back a man.